Morpheme Remedies Virgin Coconut oil is pure, unrefined, cold pressed oil extracted from fresh coconut milk. The cold process method ensures that all the vital nutrients & the natural goodness of fresh coconuts are retained. This is considered the highest quality and healthiest form of coconut oil. Coconut oil can help improve the texture, evenness of tone, pore size and luminosity of your skin. Coconut oil helps keep your hair fully moisturised, it promotes full growth and creates strong hair whilst keeping the scalp free from flakes. It acts as an antioxidant and protects skin cells from UV light, pollution and the negative effects of smoke and other free radicals. It's anti-fungal, anti-viral and anti-bacterial properties make it an excellent oil for baby massage. No mineral oil, Paraben, Sulphate, Silicon, colours and fragrance. Recommendations: Should be used on regular basis for best and noticeable results. Additional Information: Morpheme Remedies has a wide range of herbal formulations, supplements along with ayurvedic well-being and beauty products that are well researched using the latest technology and in accordance with Ayurveda. The herbal extracts are sourced from the best quality sources and all products are made using the latest research techniques. 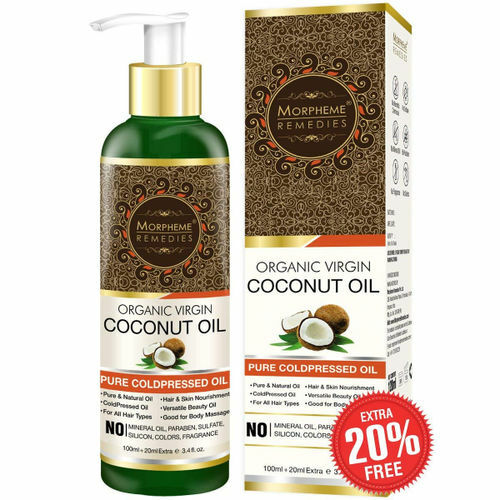 Alternatively, you can also find many more products from the Morpheme Remedies Pure Coldpressed Organic Virgin Coconut Oil range.